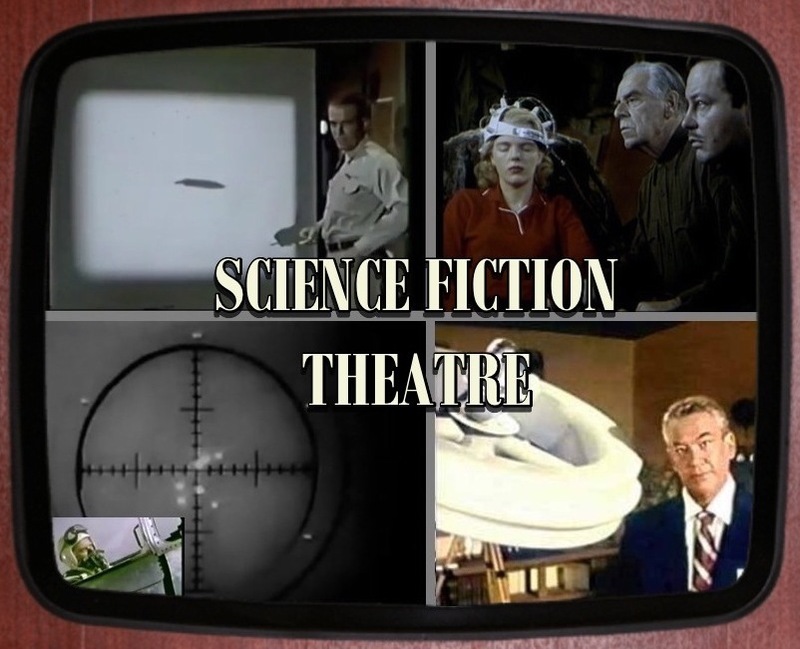 This article is was prompted by a suggestion from Graham, a STTF reader who pointed out that the 1955 television series Science Fiction Theatre produced several episodes with UFO concepts, many of which never before seen on screen. Ziv Television Programs was a pioneer in syndicated TV series, chiefly producing crime dramas, westerns and adventure shows. 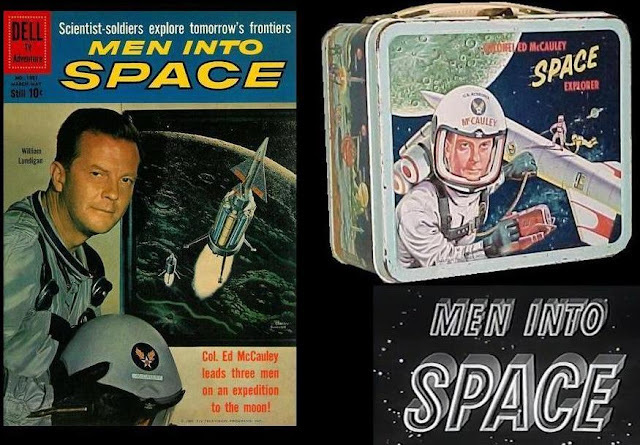 The company was founded by Frederick Ziv, and his brother Maurice Ziv co-produced two shows that featured UFO episodes, Science Fiction Theatre, 1955 - 57, and Men into Space, 1959-60. Both shows were co-produced with Ivan Tors. While Tors produced science fiction, he avoided fantasy, and had a reputation for insisting in scientific accuracy in his screenplays. Tors described his outlook in the essay, “Science Fiction” to the 1958 book, TV and Screen Writing, edited by Lola Goelet Yoakem. 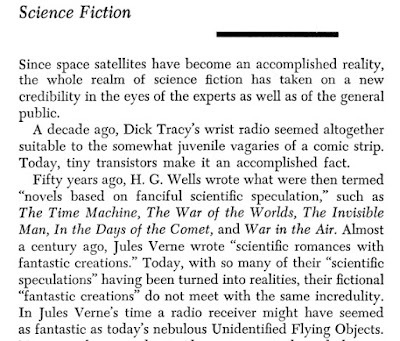 In 1955, Tors debuted a science fiction anthology program unlike anything else on the air. 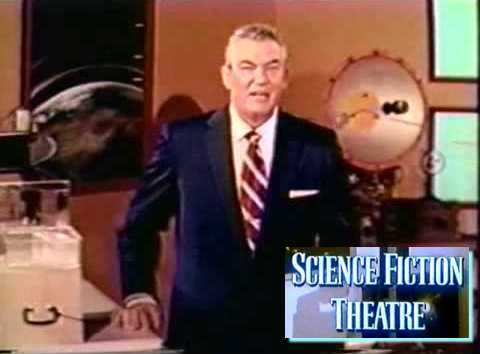 Science Fiction Theatre debuted in April 1955, with the goal of presenting scientifically plausible stories in an unsensational manner, not the kid stuff Buck Rogers SF with BEMs (bug-eyed monsters). Each half-hour episode was introduced by a grey-haired distinguished looking gentleman seated at a desk that was covered with peculiar objects that looked vaguely scientific. The stories that followed were so tedious and uninteresting (apparently because the makers' aim was to demonstrate that science fiction could be serious) that the series must have discouraged many a potential science fiction fan during the short time it ran. A bit harsh. The production values of Science Fiction Theatre were very good, and it’s notable for its first season of it being filmed in color. With its half-hour format and the opening and closing remarks by the host, there wasn’t much time left for the story. That’s possibly why some concepts were featured in more than one episode, almost as if the same story was being told from another point of view. With the limited time and television budget, some of the episodes almost seem if they could have been radio plays since so much happens offscreen, and some stories would have worked as well or better as radio dramas. What really important to us though, is that the series frequently dealt with the topic of alien contact and flying saucers. Luckily, these shows have been preserved and can still be watched today. 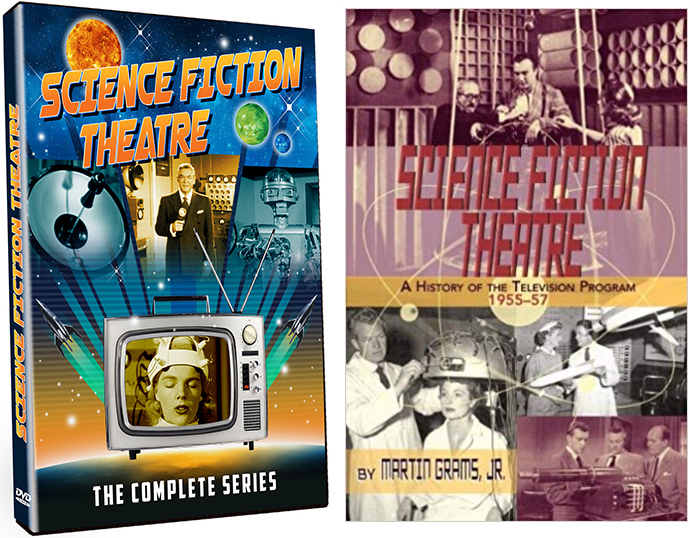 Science Fiction Theatre is available in a DVD set, and can sometimes also be found online (usually at far lower video resolution). Flying saucers had been in the public eye for less than ten years when the series began, and it’s interesting to see how ideas about them were being digested and circulated to the public. 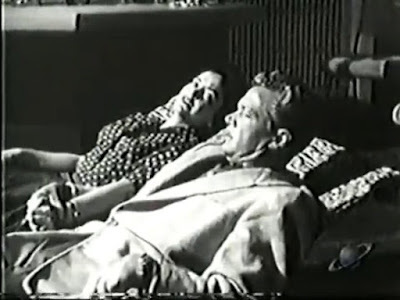 Graham, in his letter about the series said, “ if nothing else they show just how quickly UFO lore developed after the Arnold sighting.” Tors took pains to bring credibility to Science Fiction Theatre, so it’s very interesting that he’d risk losing it all by addressing the highly controversial topic of UFOs. 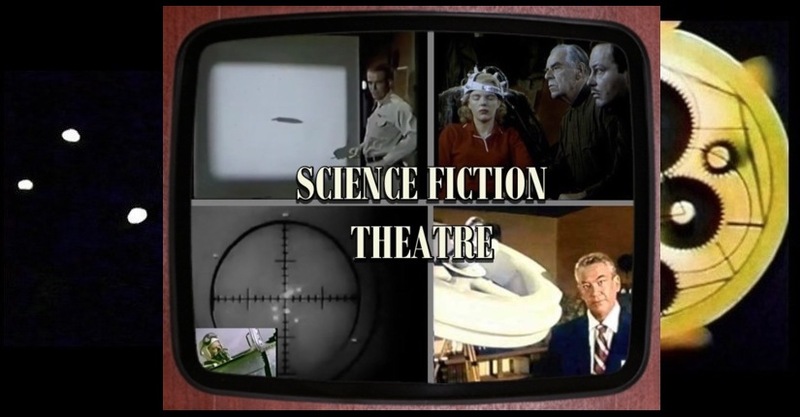 Science Fiction Theatre aired in the years between two major news-making UFO events, the 1952 Washington, DC sightings and the 1957 Levelland, Texas case which overlapped with the launch of the Soviet Sputnik satellite. Flying saucers were not widely embraced by most science fiction authors. While most supported the possibility of life throughout the universe, they didn’t see the reports of UFOs as any evidence of that. Hollywood’s version of science fiction was another matter, and when adapting tales of extraterrestrial visitors, they swapped the alien spaceships for flying saucers. This was done for two overlapping reasons: 1. It capitalized on the popularity of the UFO mystery. 2. It was simple, an expedient shortcut in storytelling. Since everyone had heard of flying saucers, lengthy exposition about spaceships, interstellar travel and extraterrestrial life could be virtually eliminated. 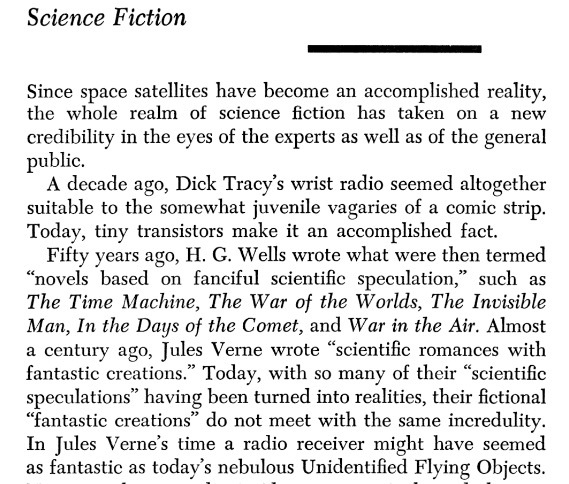 Nevertheless, most printed straight science fiction kept saucers on the sidelines. In the movies, on radio and television, only occasionally did extraterrestrial stories feature flying saucers and their related lore. Science Fiction Theatre took a different approach, and their default position from the first episode was that flying saucers are real. Beyond - screenplay by Robert Smith and George Van Marter from a story by Ivan Tors. This story is reminiscent of the Captain Thomas F. Mantell crash story. A test pilot bails out when he thinks he’s going to crash into a UFO. His expensive test plane is lost, and there’s an inquiry as to whether he’s fit to fly. Since the object was not seen on radar, the brass thinks he hallucinated. The UFO was a long gray metallic cylinder, and there is speculation that the saucer was powered by magnetic force (as in Frank Scully’s Behind the Flying Saucers). Y-O-R-D - screenplay by Leon Benson and George Van Marter, story by Ivan Tors. The world's leading expert on telepathy, Dr. Lawton, is sent to a military weather station at the North Pole, where the crew there have suddenly become psychic. The mysterious code they're mentally receiving, Y-O-R-D, turns out to be an emergency call from an extraterrestrial source. This episode features Kenneth Tobey, back in familiar territory from The Thing from Another World. A husband and wife team are assigned to travel to Mexico and take photographs of the UFOs being reported there. They stumble upon the body of a dead alien, find ET technology and cope with radiation exposure. The Strange People at Pecos - screenplay by Doris Gilbert. The Kerns, the new family in town, display strange behavior, leading a boy and his father to suspect that they could be spies from flying saucers. The new girl seems to feel no pain, her father is heard sending a message to aliens, and he has model saucer that defies gravity. When confronted, Mr. Kern has an explanation, but is it just a cover story? Postcard from Barcelona - screenplay by Sloan Nibley, story by Tom Gries and Ivan Tors. After the sudden death of a brilliant scientist, his unfinished work is examined and it’s revealed that his technological advances were due to information fed to him by extraterrestrials. Parts of this story are reminiscent of the later UMMO story (a hoax). Are We Invaded? - screenplay by Norman Jolley. A couple witness a UFO, but when they report it to the the woman’s father a prominent astronomer, he dismisses their sighting as an optical illusion. The man, a reporter, goes on a quest to film a documentary of witnesses and prove the reality of UFOs. He winds up looking foolish when the astronomer is able to explain each of the sightings. There’s a “snapper,” however, the mysterious Mr. Galleon has given him a photograph that could not have been taken on Earth, and leaves behind an exotic forwarding address. The Other Side of the Moon - screenplay by Robert M. Fresco and Richard Joseph Tuber. New astronomical photographic equipment reveals evidence of advanced alien technology on the moon. When an unmanned photographic mission is launched to explore, it crashes on the far side of the moon, but the photos it sent back confirm that aliens had come and gone – without bothering to contact the Earth. Scientists conclude that we aren’t ready, still too primitive. Bullet Proof - screenplay by Lee Hewitt. An escaped convict tries to cash in on debris recovered from a UFO landing. Long before the Roswell incident was reinvented as an ET story in the late 1970s, this story features a strange, near-indestructible foil-like metal from a damaged UFO. Shades of Roswell! UFO mystery metal. The scientist first thinks it aluminum foil, but when the convict strikes it with a hammer, or shoots it with a pistol, the sheet is undamaged. The con meets a buyer and takes him to the UFO landing site, where sand was found to be fused into glass. The examining scientist speculates that aliens deliberately left their technology behind for us to find. The Missing Waveband - screenplay by Lou Huston, story by Ivan Tors. Dr. Vincent Milhurst makes radio contact with a mysterious stranger, a distant unknown scientist who provides him with knowledge of technology that will prevent nuclear war, ensuring peace on Earth. When Milhurst uses the same technology to trace the location of the stranger’s signal, it’s determined to be from far, far away. Beam of Fire - screenplay by Stuart Jerome, story by Ivan Tors. A mysterious beam is destroying the development of rocket fuel, apparently in an attempt by extraterrestrials to postpone Man’s space exploration. The Legend of Crater Mountain - screenplay by Bill Buchanan and Lue Hall. A teacher is tormented by three siblings that possess psychic powers. Local legend has it that their family arrived 200 years earlier in a UFO crash. The plot is similar to Zenna Henderson's “The People” series about alien refugees living among us which had debuted in the story "Ararat" in the Oct, 1952 issue of Fantasy and Science Fiction magazine. Jupitron - screenplay by Arthur Weiss. Alien abduction: A couple are taken to one of Jupiter’s moons where they encounter a long-missing scientist who shares the secret of a substance that will solve the Earth's hunger problem. The Last Barrier - screenplay by Hendrik Vollaerts (as Rik Vollaerts). While an experimental rocket travels to the Moon, there are saucer sightings on Earth, and radar shows the rocket is followed by UFOs. The ship mysteriously crashes on return, apparently in an attempt by extraterrestrials to postpone Man’s space exploration. Sun Gold - screenplay by Peter R. Brooke. Bolt of Lightning - screenplay by Meyer Dolinsky. The Strange Lodger - screenplay by Arthur Weiss. While testing a device for TV ratings that can detect what channel viewers are watching, it’s discovered that a strange old man is tuned into the unknown channel 84. More puzzling, he’s not receiving, but sending messages about Earth to a ship orbiting the planet. 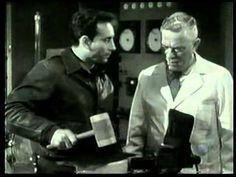 Science Fiction Theatre continued in reruns through the end of the 1950s and was broadcast again in syndication the early 1960s under the title Beyond the Limits. There were a few mentions of the show in period UFO literature. SCIENCE FICTION THEATRE, WRCA-TV, Fridays at 7 p.m., has a story based on saucers every once in a while. Most recent was 5 October. TRUMAN BRADLEY, host... said that the flying saucers constitute one of the greatest puzzles put before man. Ivan Tors' Science Fiction Theatre only lasted two seasons, but delivered a phenomenal 78 episodes. 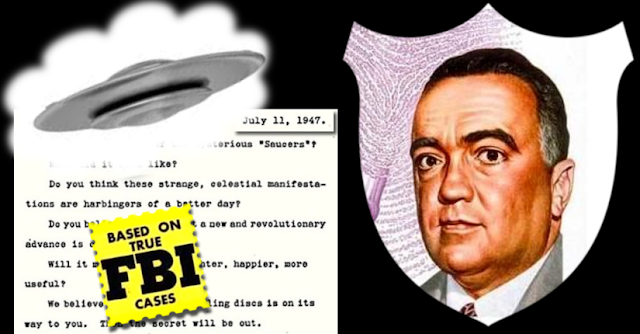 The series should be remembered for reflecting the public's interest in flying saucers, and for possibly helping shape public opinion towards the extraterrestrial hypothesis for UFOs. Ivan Tors was part of another Ziv Television space-themed series, Men into Space, an attempt at a realistic show about space exploration starring William Lundigan as astronaut Col. Edward McCauley. Executive Producers were Maurice Ziv and Ivan Tors, and it ran one season, from 1959-60. Most episodes were straight astronaut adventures, but in a few stories they encountered UFO-type situations and indications of alien civilizations. “Is There Another Civilization?” - screenplay by Jerome Bixby, episode 24, March 23, 1960. During a routine flight, the astronaut’s ship is struck by a meteor, but when analyzed the metal appears to be manufactured, and unlike anything on Earth. “From Another World” - screenplay by Beirne Lay Jr., episode 29, April 27, 1960. “Beyond the Stars” - screenplay by David Duncan, episode 31, May 11, 1960. A signal from distant space is revealed to a communication from a deep space. “Mystery Satellite” - screenplay by Jerome Bixby, episode episode 37, Sept. 7, 1960. A “meteor” appears to be following the astronaut’s ship, matching their maneuvers, indicating it is under intelligent control. Men into Space was not renewed after the first season. For more details on Ivan Tor and his science fiction work, see Gary Westfahl’s Biographical Encyclopedia of Science Fiction Film, 1901-2016. Ivan Tors’ obituary at The New York Times. Y.O.R.D. is also of interest to Star Trek fans as DeForrest Kelly makes an early TV appearance in the episode. I was confused by one of the news clippings included in your article. 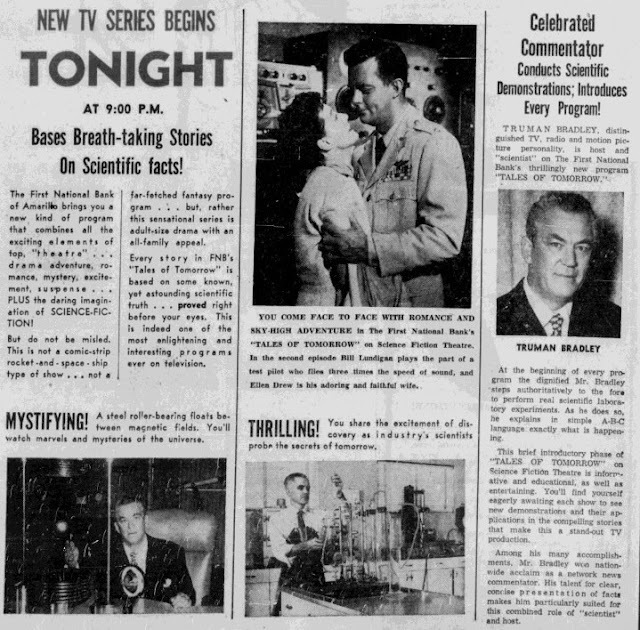 There was a TV SF series called Tales of Tomorrow that aired on the ABC network from 1951 - 1953. Each episode was performed live, recorded on kinescope. (https://en.wikipedia.org/wiki/Tales_of_Tomorrow) Two years later Science Fiction Theater premiered. 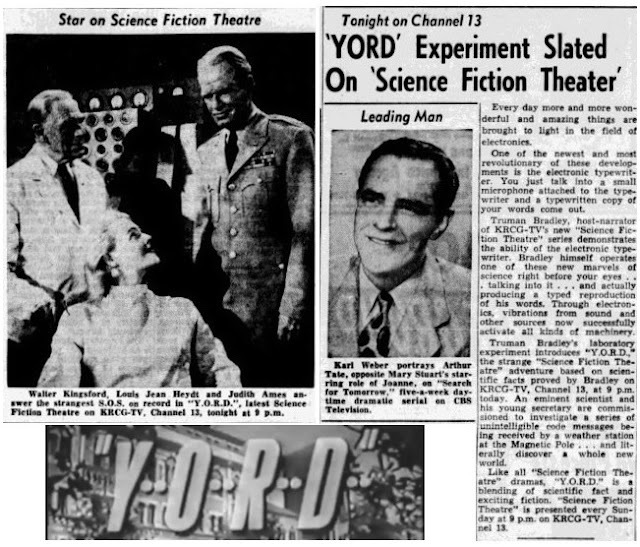 (https://en.wikipedia.org/wiki/Science_Fiction_Theatre) The Amarillo Globe-Times news clipping talks about a new series called Tales of Tomorrow except at one point when it refers to Tales of Tomorrow on Science Fiction Theater. I did some Googling but couldn't find any connection between the two SF series. It appears the intro segment by Truman Bradley was called Tales of Tomorrow. Maybe a TV SF fan out there can provide some light. Ray, my guess is the local station aired it (or at least advertised it) under that title.